We have not cruised with Tui before and we were pleasantly surprised when we arrived onboard. 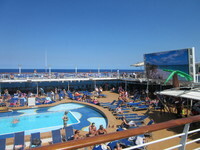 The ship is lovely and the crew is extremely friendly and helpful, nothing is too much trouble for them. The cabin was clean and comfortable with a balcony and the maid service was excellent. We thought the food and service in the dining room was excellent with a good choice and the food in the self service restaurant and other areas was also good. The shows each evening were superb and the show team are very professional, they would all not be out of place on the West End theatres. The entertainment in the Live Room was also really good. There was no need to upgrade the drinks package as there was plenty of choice on the inclusive one with all the usual well know branded drinks available. There is a small gym and sauna which is adequate and the spa is quite good. The shops don’t really have that much choice but I am sure others may disagree. 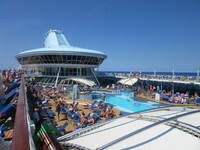 The pool can get quite noisy with all of the sun beds full and the entertainment going on around it. However the covered pool is a much quieter area. So you can choose which you prefer. All in all the whole trip was fabulous and I would certainly sail on this ship again. We have not cruised with Tui before and we were pleasantly surprised when we arrived onboard. 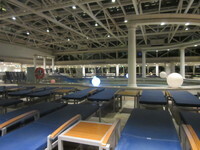 The ship is lovely and the crew is extremely friendly and helpful, nothing is too much trouble for them. The cabin was clean and comfortable with a balcony and the maid service was excellent. We thought the food and service in the dining room was excellent with a good choice and the food in the self service restaurant and other areas was also good. The shows each evening were superb and the show team are very professional, they would all not be out of place on the West End theatres. The entertainment in the Live Room was also really good. There was no need to upgrade the drinks package as there was plenty of choice on the inclusive one with all the usual well know branded drinks available. There is a small gym and sauna which is adequate and the spa is quite good. The shops don’t really have that much choice but I am sure others may disagree. The pool can get quite noisy with all of the sun beds full and the entertainment going on around it. However the covered pool is a much quieter area. So you can choose which you prefer. All in all the whole trip was fabulous and I would certainly sail on this ship again. The Cabin was clean and fairly spacious with a balcony with small table and two chairs. Lots of wardrobe space and drawers so plenty of room for everything. The bed was very comfortable and we slept soundly every night with no noise of any kind other than a slight storm one night. There is a fridge with drinks you have to pay for but room in it to keep any bottled drinks you may have. Also a kettle with tea bags and coffee provided. There is also a glass jug to get drinking water from the water dispenser by the lifts. The cabin staff were Vanessa and Marco who were both extremely friendly and attentive and went out of their way to make you feel at home.